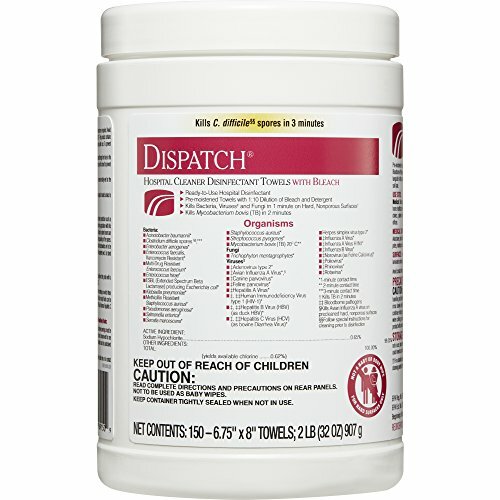 Dispatch Hospital Cleaner Disinfectant Towels with Bleach are intermediate-level hospital disinfectant wipes that meet CDC CMS and OSHA guidelines for cleaning and disinfecting surfaces in healthcare facilities. They are ready to use, 1 step cleaner-disinfectant wipes containing a 1:10 bleach dilution. These premoistened towels are EPA-registered to kill C. Difficile spores in 3 minutes and other common healthcare pathogens just 1 minute. These wipes kill 99.9999% of C. difficile spores, according to the current EPA recommended testing standard (June 2014). This is for clinical useage for disinfecting equipment and high-touch surfaces. These wipes feature an anticorrosion agent and are formulated for broad surface compatibility with healthcare surfaces including stainless steel, glass, plastic, porcelain, glazed ceramic, laminated surfaces and vinyl. Features a light fragrance for patient and staff comfort. Intended for use in Healthcare settings.